Read more about scheduled 2019 Training Events (may include after-the-event photo and video documentation when available). Read more about the scheduled 2017 Training Events (includes after-the-event photo and video documentation where available). 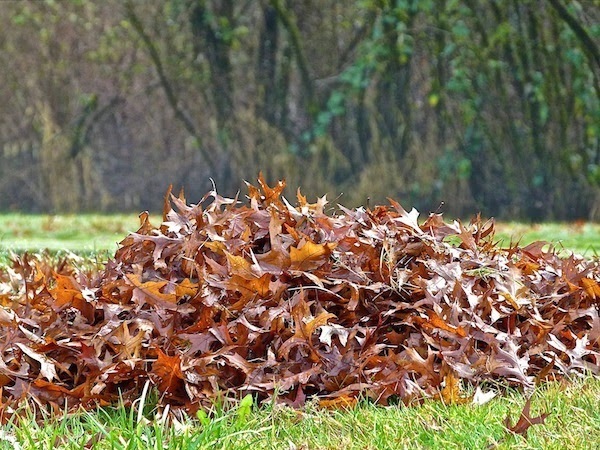 Did You Know Leaves Can Be Free Mulch? 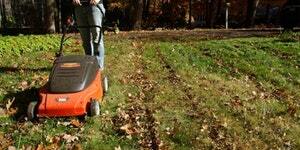 Turn your leaves into fertilizer for your lawn. Peter Navarra Landscaping will demo mulch mowing. Jenny Dobell will demo her leaf mulcher vacuum. Follow this EVENTBRITE link to register for free demo (drop-ins also welcome!). Program is free and will be helpful to homeowners and landscapers alike, as both homeowner and professional mulching equipment will be demonstrated. After the demonstration there will be time for questions and answers. 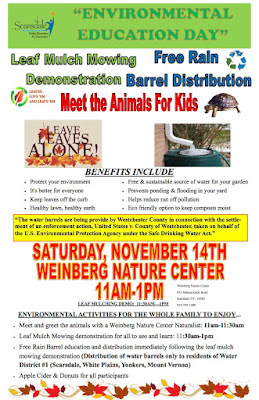 Inquiries regarding this event can be directed to: Anne Jaffe Holmes at the Greenburgh Nature Center 914-813-1251. For the residents of Bronxville, Eastchester, Mamaroneck, New Rochelle, Rye, Scarsdale, Tuckahoe and neighboring villages and towns. Open to residents and landscapers throughout the county. Come mingle with your neighbors and get your questions answered about this easy, common-sense practice! Wouldn’t it be nice to enjoy a fall season with less raking and noisy leaf-blowing in your neighborhood and fewer leaf piles clogging the streets? Grab your landscaper & let them know about this informative event. For the residents of Bronxville, Eastchester, Mamaroneck, New Rochelle, Rye, Scarsdale, Tuckahoe and neighboring villages and towns. Open to all residents and landscapers county-wide. 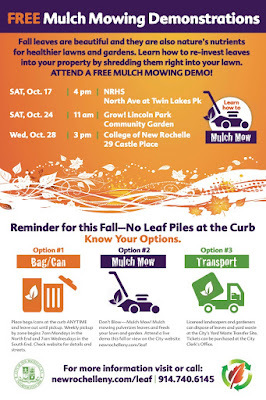 Free Mulch Mowing Workshop will be presented in New Rochelle at Twin Lakes Park, North Ave. in front of the New Rochelle High School. Click poster (below) to read the details. Open to all residents and landscapers county-wide. Rather than raking, bagging, or transporting fall leaves offsite this year, consider mulching, a sustainable alternative that actually benefits lawns and gardens! 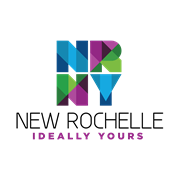 The City of New Rochelle in partnership with Greenburgh Nature Center will host this free 'how to' workshop. Join us for a live demonstration by a professional landscaper, get your questions answered, and see how easy it is to put those leaves to work to enrich your soil, grass and flowers! • A healthy property: Mulching recycles nutrients into the soil to feed lawns & plants, provides a free natural fertilizer, and helps retain moisture. • Savings of time and effort: Mulching in place is easier and faster than raking or blowing leaves. • Helping the environment: Leaf piles block streets and traffic, clog storm drains, and result in excess nutrient runoff (phosphorus & nitrogen), polluting our waterways. Transporting and disposing of grass and leaves as yard waste wastes energy and contributes to pollution, too. 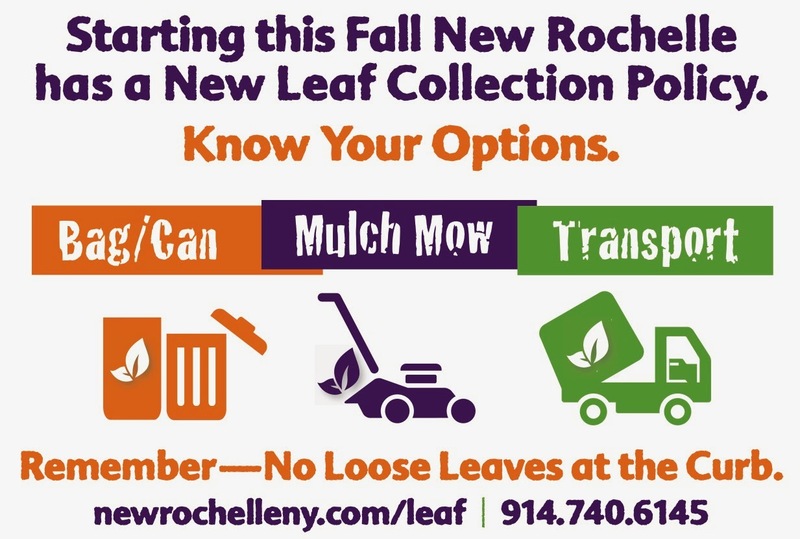 Additional information is available on the City’s website at newrochelleny.com/leaf or by calling 914.235.4029. Read more about the scheduled 2015 Training Events (includes after-the-event photo and video documentation where available). All programs are free and will be helpful to homeowners and landscapers alike, as both homeowner and professional mulching equipment will be demonstrated. After the demonstration there will be time for questions and answers. 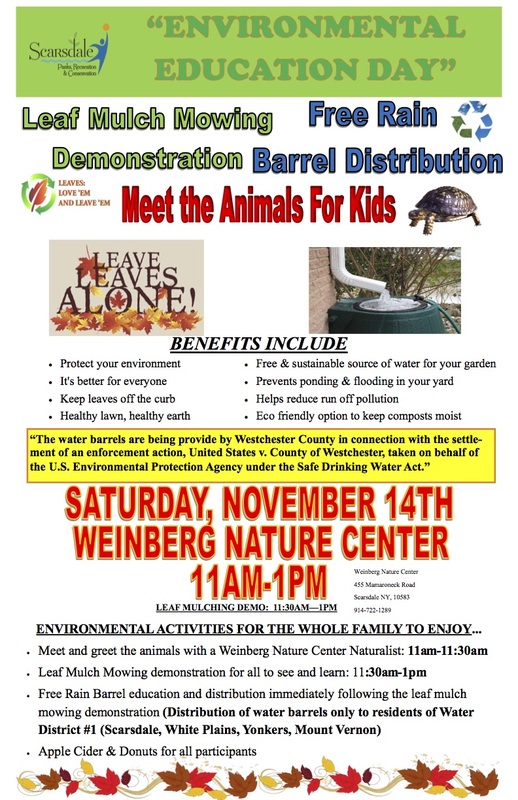 Inquiries regarding these events can be directed to: Anne Jaffe Holmes at the Greenburgh Nature Center - email - 914-813-1251. What is Mulch Mowing and How Do I Do It? Benefits of Leaf Mulching with Chip Osborne - Monday, Oct. 5th, 7:30pm, @ Scarsdale Library (54 Olmsted Rd.) in the Scott Room. 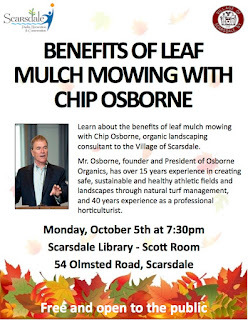 Read the article about the leaf mulching initiative in Scarsdale (from the 10/23/14 Village Voices column of scarsdale10583.com). Leaves are a resource - please come and learn how to use them! Click brochure (below) on 'Environmental Education Day' to read the details on activities for the whole family. Free apple cider & donuts for participants. This Mulch Mowing Workshop will be presented at the College of New Rochelle Campus - 29 Castle Place, New Rochelle, NY 10804. 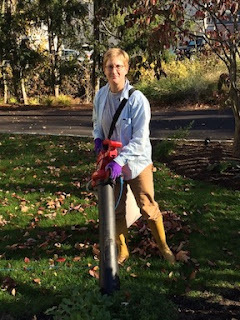 Mulch Mowing Workshop - Saturday, Oct. 24, 11am @ Lincoln Park Community Garden. 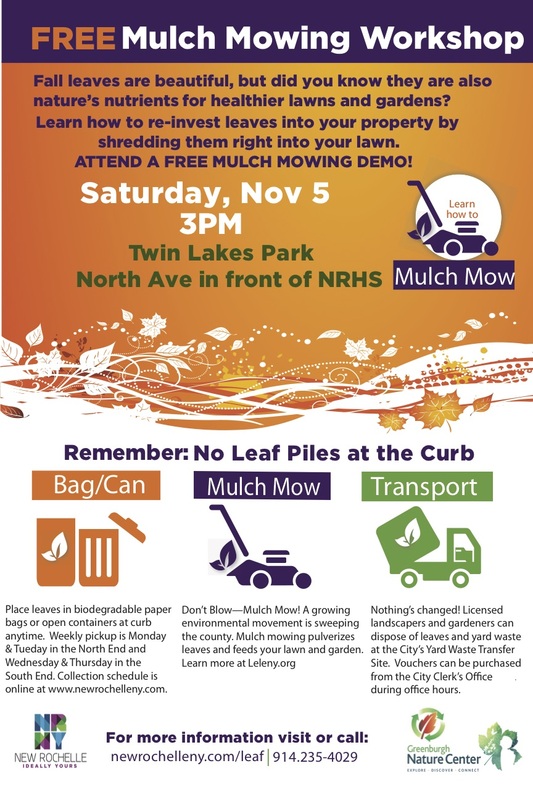 This Mulch Mowing Workshop will be presented at New Rochelle High School - Twin Lakes + North Ave., New Rochelle, NY 10804. 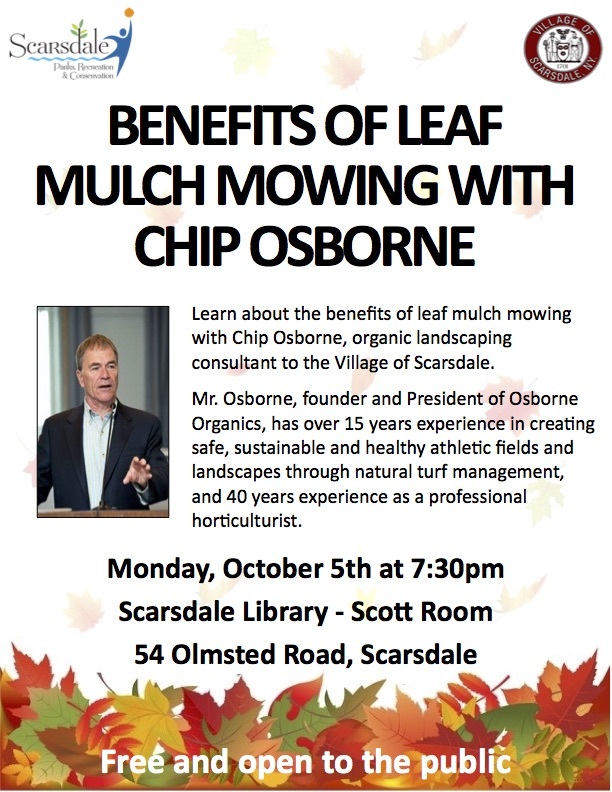 Learn about the benefits of leaf mulch mowing with Chip Osborne, organic landscaping consultant to the Village of Scarsdale. Monday, October 5th, 7:30pm @ Scarsdale Library - in the Scott Room, 54 Olmsted Road, Scarsdale. 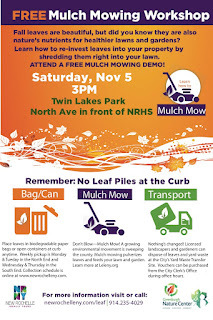 This Mulch Mowing Workshop will be presented at Ward Acres - 54 Bon Air Ave, New Rochelle, NY 10804. Read more about the scheduled 2014 Training Events (includes after-the-event photo and video documentation where available). 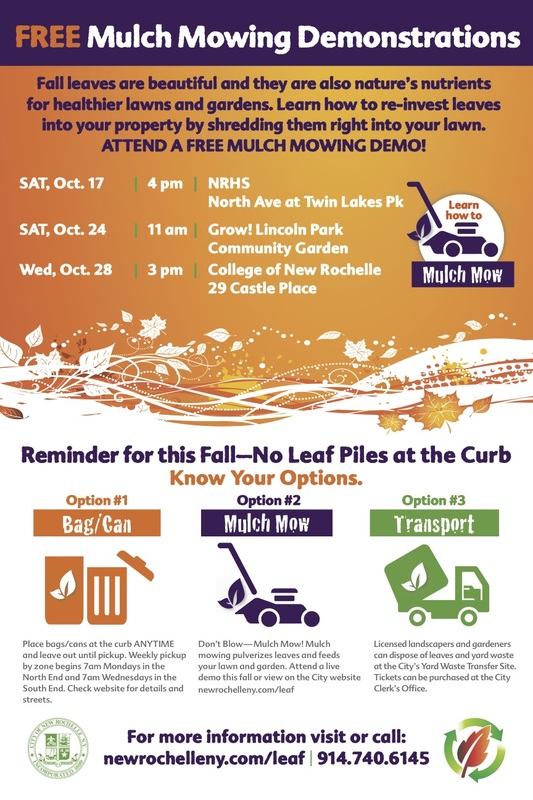 The City of New Rochelle has contracted the Greenburgh Nature Center to organize a series of free mulch mowing demonstration/trainings for landscapers and property owners to be held in different areas of New Rochelle through the month of September and October. FREE Mulch Mow Training - Tuesday, Sept 30, 7pm @ Irvington Library, 12 S.Astor St.
Friday, Oct. 24, 10am - RESCHEDULED DUE TO RAIN! Note: for the latest info on these training events, including possible rescheduling, please check out the Irvington village website's LEAF Pickup page. Attention Landscapers: There will be a FREE raffle of one fully installed mower mulching system at each workshop. 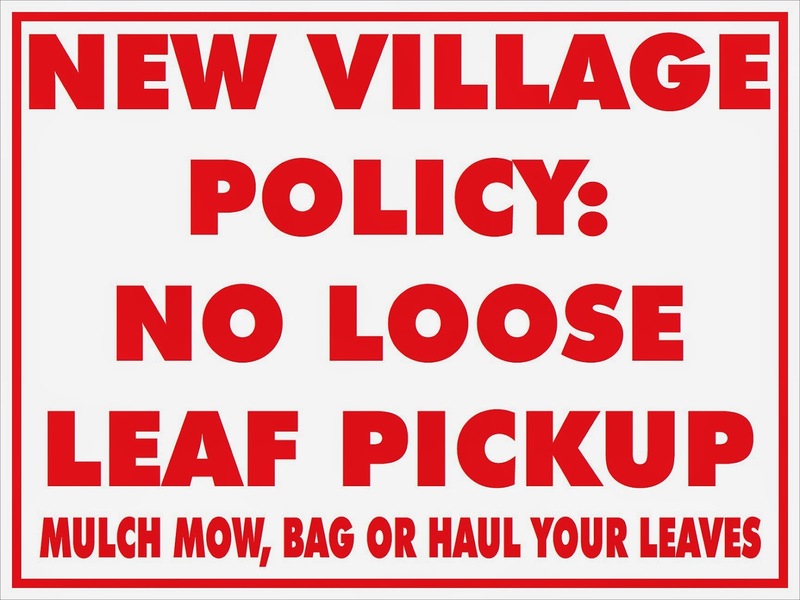 Read the recent article about leaf mulching initiative in Scarsdale (from the Village Voices column of scarsdale10583.com).